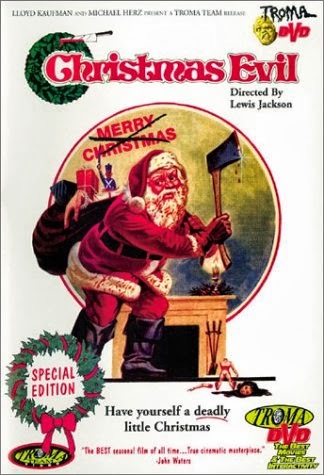 This is one of the first movies in the "slasher-Santa" sub-genre (though certainly not the origin of the idea). Wikipedia says it has a cult following, which I can definitely believe. It's a bizarre movie; not entirely bad but certainly not what I'd call good, either. This is generally considered a slasher, but I think that's misleading. The story is entirely told from the perspective of the killer, and his victims aren't portrayed in a sympathetic manner. To my mind, that plants this firmly in the category of revenge-flick, rather than slasher. The movie focuses on Harry, a toy-factory employee who loves Christmas and is emotionally scarred from seeing his parents together when his dad was dressed as Santa. He's bullied at work and lives a reclusive life, and is utterly obsessed with Christmas (no jokes, please). The character spends his downtime spying on the neighborhood children and recording their good and bad deeds in a pair of books. He sets out to punish the worst of the bunch, but doesn't wind up hurting him (it's not really clear whether he'd have done so given the chance). At this point, it really felt like the movie was going to devolve into having Harry kill the bad kids (or possibly even the good ones), but - fortunately - they went in a different direction. Harry has a nervous breakdown and decides to become Santa. Despite the movie's provocative title, he doesn't really go evil, though. He's mostly interested in giving gifts, though he does kill a few people who seem especially awful. The movie's body count is relatively contained - four, unless I miscounted, in two separate scenes, neither of which are especially disturbing. The movie kind of sputters on. It's more interesting than a lot of similar films, partially due to some bizarre filming choices. I think they were going for psychological thriller, but Harry never feels real enough to deliver on that. Still, the sheer surreality of the thing is enough to keep it from being a total loss. The ending swerves into extremely strange territory. Chased by a mob wielding torches, Harry's van careens out of control and drives off a bridge. Instead of crashing into the water, it flies off into the night as we realize that Harry has truly become Santa Claus (or something). It's absurd, completely out of tone, and not especially original, but I like it better than any of the more conventional endings they could have slapped on. The movie oscillates between fascinatingly weird and boring. It's never really scary, though I'm not sure it wanted to be. If anything, it seemed to trying for a Hitchcock vibe but couldn't pull it off. Still, if you're looking for an off-kilter killer Santa, you could do much worse than this. Granted, you could do far better, but that's another matter.